I admit it, I have a sweet tooth. And almost as much as I love chocolate, I love caramel! Put the two together, and oh my….but wait, I’m jumping ahead of myself to another post later today. I think I’ve made my own caramel sauce maybe once. On a stovetop and it took a lot of stirring and babysitting. So when I discovered I could make it in the microwave in a matter of minutes, it was a revelation! Now, this isn’t exactly healthy, though I have swapped out the heavy whipping cream for 2% milk, which yields a slightly thinner caramel sauce (totally okay by me) yet no less delicious. 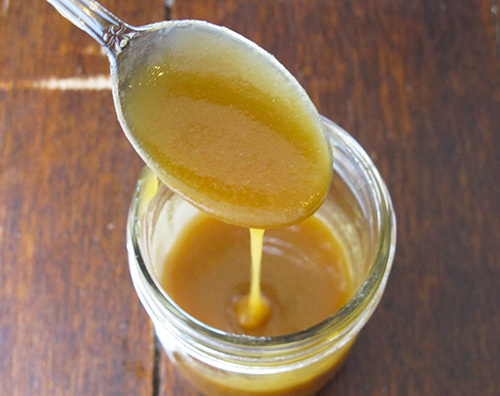 It is all about portion size as a little goes a long way with this caramel sauce. You can use the caramel sauce drizzled over ice cream, paired with chocolate, dolloped in your coffee, just to name a few ideas to get you started. Enjoy! In a deep glass bowl with high sides, melt the butter in the microwave. Whisk in the light brown sugar. Then slowly whisk in the milk until the mixture is smooth. Microwave for 2 minutes then stir. Return to microwave for another 2 minutes. 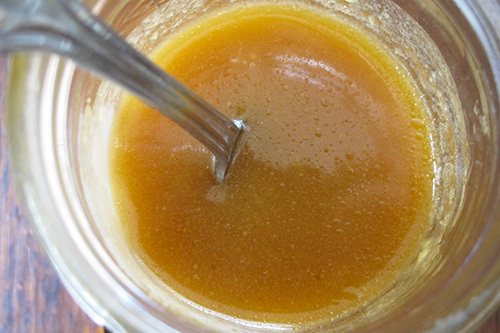 Mixture should be bubbling and slightly thickened. Watch closely as microwave times will vary depending upon the power of your machine. Remove from microwave and stir in vanilla. Mixture will thicken more as it cools. This is not a very thick caramel sauce. If you want a thicker caramel, use ½ cup heavy whipping cream in place of the milk.